Grasses are members of the family Poaceae (formerly called Gramineae). There are over 8,000 species of grasses found throughout the world. They are the dominant plants of the prairies and savannah but can be found wherever plants can grow from the arctic marshes to tropical swamps. In fact, 25% of the world's vegetation belongs to the Poaceae. Above images courtesy of Mary Jelks, M.D. Grasslands are characteristic of large areas of Oklahoma. These regions are southernmost parts of the true prairie that extends as far north as Saskatchwan, Canada. Vegetation of this region includes the tall-grasses of the east, the mixed grasses of central Oklahoma, and the short grasses of western Oklahoma. 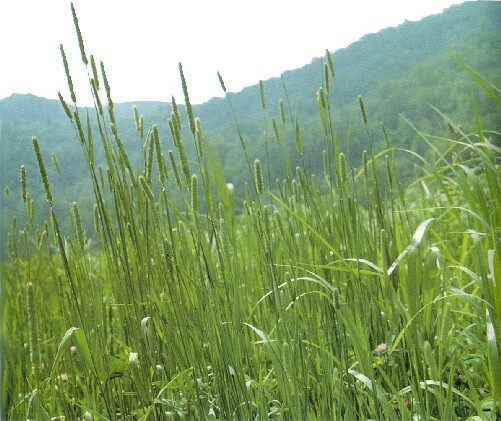 Native grasses are dominant in the grasslands and generally have little allergenic significance. Bouteloua (gama grass) is the only grass mentioned in the hay fever literature. However, much of the area is being modified and native grasses are being replaced by species that are greater causes of allergies, including lawn grasses as well as those used for pasture. It important to know that in some areas of the world, grass pollen is the major airborne allergen, while in Oklahoma spring tree pollens and fall ragweed pollen are more serious allergens. Grass pollen is characterized by a single pore and is easily recognized as grass pollen; however, identification of the genus is difficult in the light microscope. 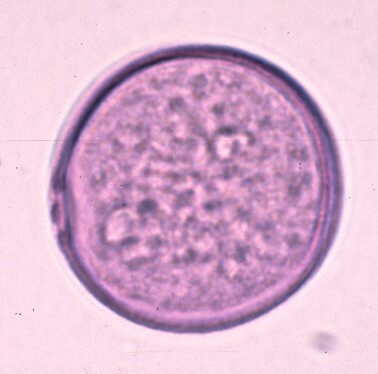 The images below are typical of the grass pollen seen in atmospheric samples. Grasses typically begin pollinating in May. For many native grasses this is the only pollination period while ornamental and lawn grasses may continue to produce pollen throughout the summer and into the fall.